The operators of a major North Sea wind power development off Aberdeen have applied to extend its working life. 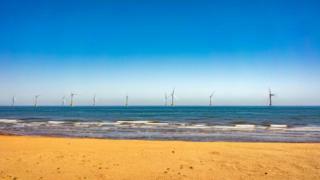 A total of 11 turbines make up the European Offshore Wind Deployment Centre (EOWDC). Developed by Swedish energy group Vattenfall, the wind farm generated its first power in July last year. Vattenfall is asking the Scottish government to change its operating lease from 22 years to 25 years. Project director Kevin Metcalfe said: "If approved, the longer operating life of the wind farm will deliver a boost to local jobs, businesses and the generation of more fossil free electricity." Donald Trump battled unsuccessfully in the courts to halt the project before he became US president. He had argued the development would spoil the view from his Aberdeenshire golf course at Menie.